Tomato based pizzas are delicious but for something different try a pizza bianca (white pizza). The combination of smoked salmon, creme fraiche and spinach works beautifully in this recipe. Pre-heat oven to 200 degrees Celcius. Spoon one tablespoon of creme fraiche on to pizza base and smooth out leaving about 1 inch around the diameter. 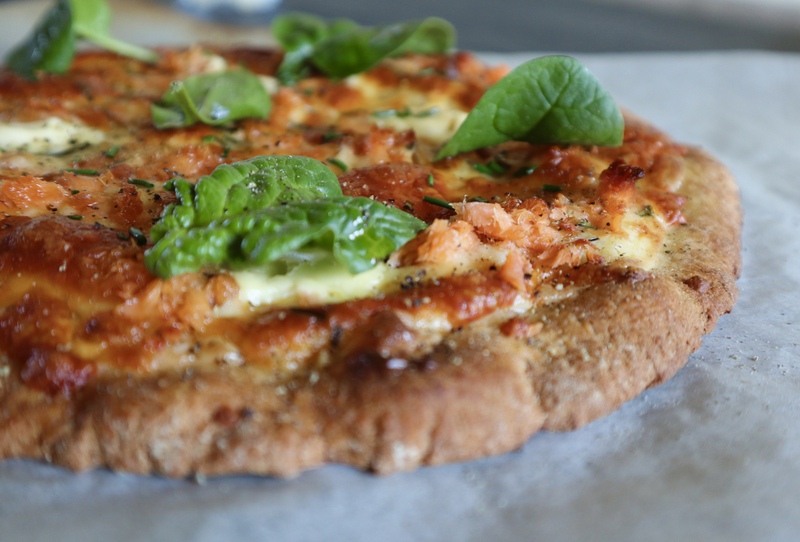 Top with flaked salmon and chives and top with mozzarella. Dollop with remaining creme fraiche. Lay pizza on baking paper on a oven proof rack and bake until cheese is golden and bubbling (approximately 12-15 minutes). Remove from oven, top with spinach leaves, a squeeze of lemon juice and cracked pepper. Enjoy! Love pizza? Click here for our Tomato, Rocket and Free Range Egg Pizza or here for our Mexican Pizza with Roasted Sweet Corn, Red Pepper and Avocado. I feel like eating pizza now . It looks delicious! Thank you for the recipe. I am allergic to tomatoes, so this is perfect for me.